News breaks of a deadly virus in Asia, but despite fatalities, few people take it seriously. Sheltered within their university bubble, Samantha and Louise are convinced the UK is invulnerable to this threat, until gruesome events unfold around the world and the death toll rises from hundreds to millions. By the time the virus reaches England and students on campus start falling sick, Samantha has to weigh up the risks of travelling home to London. She decides to sit tight with Louise and wait for everything to blow over. But the situation further deteriorates in ways the two friends couldn’t have envisaged. Their student flat is no fortress and there’s only one place they’ll be safe: The Range. Map of the Range – not in the book. 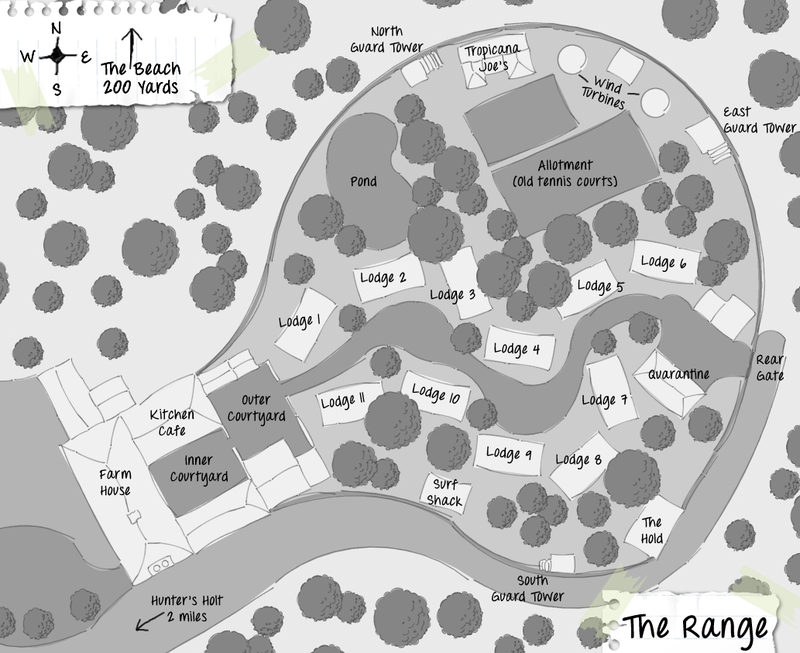 When I first started writing The Range I had an image in my head of what the place actually looked like. I knew where my characters were going when I wrote each scene, which path they were on, where each building was located and so on. Over time I realised I’d been resisting the urge to scratch an itch. I took a day to craft a map of the Range so I could pin it on the wall above the screen. It made it feel real, like I was writing about a real place. In truth it is indeed a real place, well, the location is, and a single building that already exists on the North Norfolk coast. Over time I adjusted the map, added features like trees and changed the fonts, tweaking little bits to make it look hand-made. I didn’t include it in the book because I wanted readers to use their imagination. Personally, there are times when I want to see a map in a book, and other times when I find them infuriating because I come out of the story, flick to the front, check a location and then return to the story. Maybe this one differs from what you pictured (or will when you read it) but I’m glad I shared it with you. Click to view full-sized version.